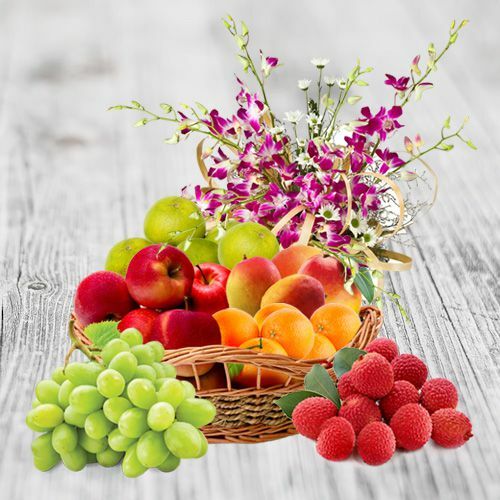 Make others feel very happy as you send this Nourishing Fresh Fruits Delight Decorated Basket and let them feel special. This alluring creeper Basket is stuffed with 2 Kg Mixed Fruits (1 Kg Apple, 1 Kg Seasonal Fruit) decorated with Orchid stem. Flowers Delivery Sonepat, Send sweets Mohali, Wedding Cake Mysore, Diwali Mithai Surat, Send Flowers and Gifts to Ghaziabad, Online Shop Kolhapur, Flower to Pratapgarh, New Year Flowers Mysore , Fresh Fruits Raichur, Send Gift Hubli, Dry Fruits to Chandigarh, Birthday Delivery Gorakhpur, Sending to Thiruvanthapuram, Flower shop Taran Taran, Purnia Online Cake Delivery.